KANSAS CITY, Kan. – He did it again. Last in the Chase for the NASCAR Sprint Cup standings and faced with an uphill struggle to make the Round of 8, Kevin Harvick and his No. 4 Stewart-Haas Racing team did what they do best—win with their backs to the wall. Moments after a restart on Lap 238 of 267, Harvick cleared Carl Edwards for the lead through Turns 1 and 2 at Kansas Speedway and pulled away to win Sunday’s Hollywood Casino 400 by 1.183 seconds. 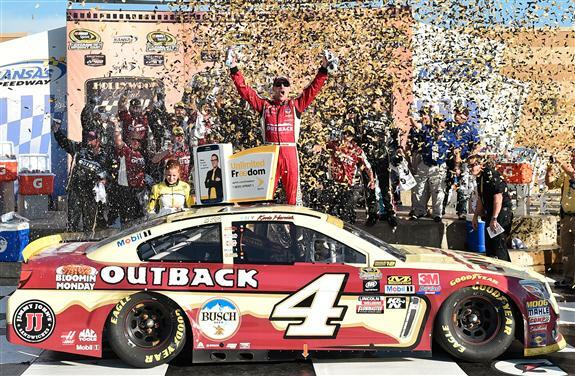 With his second victory at Kansas, his fourth of the season and the 35th of his career, Harvick joined last week’s Charlotte winner, Jimmie Johnson, in the Chase’s Round of 8 and erased the specter of racing under pressure next Sunday in the crapshoot that is Talladega. With his team chanting “I believe that we will win” in unison behind him, Harvick climbed from his car and thrust his fist into the air in triumph. Edwards, who covets a win at the track closest to his Columbia, Missouri, home, was delighted with the way his No. 19 Toyota ran, but he was frustrated with his second runner-up finish at the 1.5-mile speedway. “We ran well,” Edwards said philosophically. “That was really fun, getting to race up front. It is really tough for me to finish second here. It’s happened twice. Both of them were pretty painful. The bright side is that, yes, we raced up front. Got a lot of support from a lot of people here. Hopefully, they enjoyed that part of it. “That last restart, Kevin and Jimmie just lined up at the bottom, and they just got far enough ahead, I couldn’t hang on the outside. Then I ended up having to race Kyle (Busch) really hard there for a few laps. It let Kevin get out ahead. Joey Logano ran third in his No. 22 Team Penske Ford, an excellent recovery from last week’s 36th-place finish at Charlotte in the open race of the Round of 12. Logano enters the cutoff race at Talladega tied for eighth in the Chase standings with Austin Dillon, who finished sixth on Sunday after gaining track position with a late two-tire call. Johnson was fourth at Kansas, followed by Kyle Busch, who leaves his former “Waterloo” track 27 points above the cut line for the next round. Pole winner Matt Kenseth finished eighth behind non-Chasers Alex Bowman and AJ Allmendinger and is 29 points to the good heading to the elimination race. Among other Chase drivers, Martin Truex Jr. ran 11th, Kurt Busch 13th and Denny Hamlin 15th. From that trio, Truex and Busch remained inside the cut line, with Hamlin falling to 10th, six points behind Logano and Dillon. But the real Chase casualties at Kansas were Chase Elliott and Brad Keselowski. Six laps after passing Harvick for the lead on Lap 169, Elliott returned to pit road after a green-flag stop with his left rear tire down. That and two subsequent brushes with the outside wall relegated the Sunoco Rookie of the Year leader to 31st at the finish, leaving him 25 points behind Logano and Dillon and likely needing a victory at Talladega to advance. Keselowski was a victim of his own mistake. On Lap 190, he joined the growing club of Chase drivers who have experienced major trouble in the Round of 12. Roaring through Turn 4, Keselowski moved up the banking in front of Denny Hamlin. But Keselowski’s No. 2 Team Penske Ford got loose and slowed exiting the corner, and Hamlin had no room to brake in time to avoid tapping the 2 car. After repairs, he attempted one futile lap but retired in 38th place, dipping to 11th in the standings, seven points out of eighth. “I spun and got in the grass and tore the nose off,” Keselowski said. “I probably could have raced less hard with a big points gap coming in. With this format, it’s probably the smart thing to do, but I don’t want to race like that.